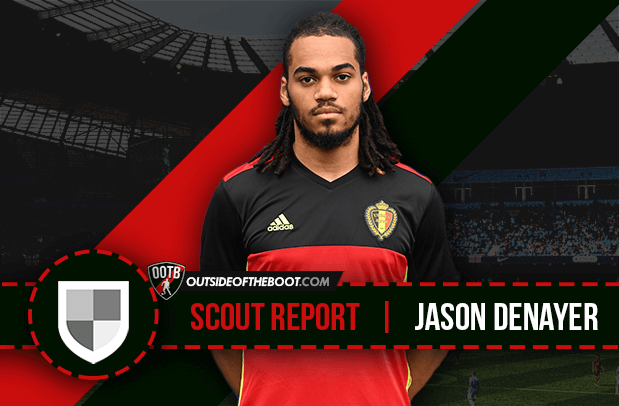 Perry Littman provides a detailed scout report on Jason Denayer, a Manchester City youth product currently on loan at Galatasaray. Belgium enter this summer’s European Championships for the 1st time since Euro 2000, this time they are bringing a whole fresh group of young players, hungry and talented. One name worth taking note on particularly will be Jason Denayer. The Manchester City defender who’s quick, strong and good on the ball, has recently had loan spells at Celtic and Galatasaray and will now be looking to impress and make his mark in France for his national team. UPDATE: Jason Denayer is back at Manchester City as of the start of the 2016-17 season. Born in Brussels, Belgium on June 28th 1995, to a Congolese mother and Belgian father, Jason Denayer started playing football aged six and began his footballing dream at youth level with FC Ganshoren. He played for another Youth Club with RSC Anderlecht and then at JMG Academy in Lier, a famous established sports organisation and training company formed by Jean-Marc Guillou, designed to create an environment where young talented players can maximize their potential. It was there that Denayer aged 14, was converted from playing as a striker to becoming a defender. Denayer credits his time at JMG for honing his football technique “I benefited a lot and if I didn’t go there, I don’t think I would be playing today, as I worked a lot on my technique there”. The Famous Academy also produced the likes of both Toure brothers, Emmanuel Eboue and Gervinho. He had been highly rated for a while and was strongly linked with several other clubs in Europe, including Manchester City where in the summer of 2013, Denayer moved abroad to join the club’s Academy and after a successful trial, he signed his first professional contract at the Manchester club. Denayer played a huge role and was ever present for the club’s Development Squad campaign in the UEFA Youth League and domestic competitions that saw his side reach the final of the U21 Premier League Cup. He was learning the trade well and was developing into a towering centre back who would be hard for opponents to get past. Denayer was included in the first team for a pre-season friendly in July 2014 and started in a 2-0 loss away against Dundee. City had signed Eliaquim Mangala from Porto in a £32m deal, and Denayer’s path to get into city’s first team squad seemed slightly blocked at this moment in time. On August 12th 2014, Celtic signed Denayer on a season-loan from City, and was new Celtic Manager Ronny Deila’s first major signing at the Scottish Club. Denayer’s debut was at home to Dundee United in the Scottish Premiership which saw him score and get Man of the Match in a 6-1 victory. Four days after he then made his Champions League debut with Celtic in a 1-1 draw against Maribor. Denayer was ever present and went on to make over 29 appearances for Celtic and got 5 goals to his name, more noticeable was the solid partnership that had developed with Dutch defender Virgil Van Dijk (now at Southampton) at centre defence which helped the club win the League Cup and become Premiership champions that season. Denayer was voted Celtic’s and PFA Scotland’s Young Player of the Year and after an excellent loan spell with Celtic, the club were desperately keen and determined to extend his loan spell by another year but Denayer had a goal of earning a first team place at Manchester City in the near future. The young defender used his spell at Celtic to his benefit as he thrived in playing regular football. In July 2015, Denayer was involved in Manchester City squad for a pre-season tour in Australia, and the Belgian signed a new five-year deal on July 13th 2015. City again decided to spend a huge amount of money on a defender, this time they signed Nicolas Otamendi from Valencia for a fee of £28.5m. 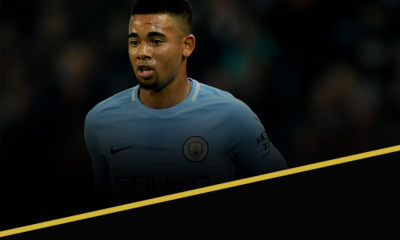 With his chance at City being limited again, in August that year he carried on gaining experience and developing his game with another season long loan spell, this time with Turkish Club Galatasaray, a new challenge that saw him make 17 appearances including another UEFA Champions League campaign. Overall a new challenge that started tough and not so smoothly compared to his spell with Celtic as the young defender was put into the team out of position at right back and struggled for game time, but has since made himself a first choice centre back and finished the season strongly. He reflects on his time at Galatasaray as “a great experience for me – much more so that at Celtic where it was too easy”. Galatasaray finished the season 6th in the Super Lig table and made it to the Turkish Cup final against Fenerbahce in which Denayer started and helped his side win 1-0 with a Lukas Podolski goal coming in the 30th minute of the game. At International level, Denayer has represented Belgium in the U19 and U21 squads. In March 2015, Denayer made his senior debut in a UEFA Euro 2016 qualifier 1-0 away win against Israel, coming on as a sub in the 67th minute. 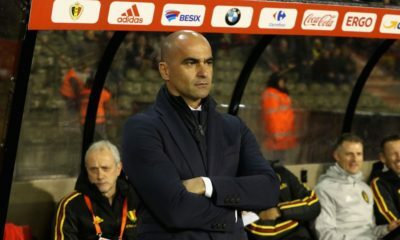 He made his first start in June later that year in a friendly match against France, which Belgium won 4-3. Standing at 6ft 2in, Denayer has an imposing presence with a physical development beyond his age. His height gives him an advantage of being dominant and strong in the air. Denayer’s aerial ability is his biggest strength and is his most impressive attribute. His athleticism and tremendous work rate is also quite impressive when compared to other players his age. Discipline is always a crucial part of a centre backs game, and Denayer has only picked up just 7 yellow cards in professional football. Denayer has often been compared to his club and international team mate, Vincent Kompany, and with good reason too. Both being strong and able to make last ditch minute tackles, as well as being very physical in their challenges. The video above shows Denayer’s defensive ability, most of the clips highlight just how well he dominates the ball in the air and his ability to win the ball back for his team. He wins mostly every aerial challenge he has to face; this impressive physicality will help deal well should he play in a more physical league such as England next season. Jason is always composed, for a young player, he never seems nervous or panics with the ball. Confidence and maturity are the most notable aspects to his game. In every game he plays in, he looks right at home. Belgium manager Marc Wilmots has praised Denayer for his performance, calm confident manner in matches. Comfortable with the ball and very fast, he allows the team to play and press against the opposition. He brings the ball out from the back and attacks with sheer pace and determination, along with a real urgency to get into the other team’s defending box as quick as he can. 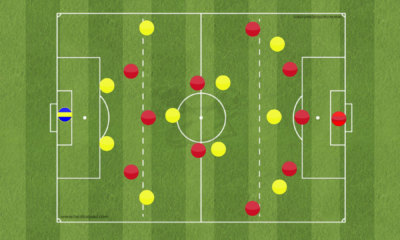 Close ball control and an ability of skill to use at the right time to get past players and set up team mates. Despite playing out of position at right-back for Galatasaray last season, Denayer worked hard and looked like he had played in that position all his life. He positioned himself well on the pitch when defending and attacking. The young Belgian was definitely able to improve the attacking side of his game, largely due to playing as a full back and also in the Turkish league he played in. The video above this time highlights Denayer’s attacking side to his game, most of the clips show how comfortable he is playing in his new position and being able to play as a modern day full-back that will push high up the field and deliver balls into the box. Denayer continued to display his natural attributes of pace and power, whilst also improving his reading of the game. 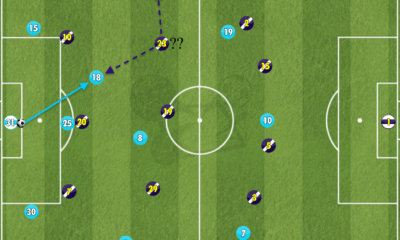 He intercepts the ball really well and will often look to make short passes along the ground. He has an ability to contribute to the attacking side of the game, playing as a striker at youth level which also points to experiences playing small sided games as another reason in knowing where the goal is. It’s hard to find any particular weakness in Denayer in his game and his build; he just needs to make sure he is at the right club, getting game time, and gaining experience as well as staying fit. He did have a few injuries at Galatasaray, most notable was when he was sidelined for 40 days and 9 games with a thigh muscle strain. Manchester City clearly have a young, raw, talented player at their club and can get a lot of people excited for the future as he has all the potential of becoming a world class name. City could have done with Denayer last season, stepping in when injuries struck. The injury-prone Kompany spent a lot of last season on the treatment table with muscle injuries and was only able to start just 12 games. Eliaquim Mangala and Otamendi haven’t really been playing their football at an impressive degree either. New City boss Pep Guardiola will be looking to replace the departing Martin Demichelis, 35, and Denayer’s time to make the next step up into the 1st team is due. The young defender could line up alongside Kompany or even replace him if he falls foul of injury again. Also with experience at playing at full-back makes him more useful to have in the squad. Guardiola likes to manage teams that are disciplined with a great focus on possession and an aggressive pressing style, consisting of a high defensive line with the full backs pushing high up their respective side, all factors that suit Denayer very well, playing at either centre or right back. Belgium boss Wilmots believes the young defender has a bright future ahead of him saying “He has enormous potential and if he continues to evolve at the rate he is progressing, he can be world class.” Wilmots was credited for Belgium’s success in qualifying for the 2014 FIFA World Cup for giving a young group of player’s confidence in themselves, a close relationship and instilling discipline to the squad. Denayer did not feature for Belgium’s 2-0 loss in their opening group game against Italy and their 3-0 win against Ireland. They had a successful qualifying campaign prior to this summer tournament, finishing top. It’s hard to predict how far Belgium will go in France. The top individual talented players that this current Belgium team consists of may not be enough when facing teams with a higher pedigree. It should be fair to say that this is Belgium’s golden generation but with a number of defenders such as Kompany and Vermaelen with long injury histories, maybe Denayer will be seen making more appearances for his national side this summer. Perry Littman is a recent graduate from Sports Management Worldwide, and has studied online courses in Soccer Scouting/Management and Analytics. His main focus is on the English, Germany and Spanish football and is a life long hammers fan.